James Arthur McKee was a farmer, and he left his beloved family farm for the last time on Tuesday, Sept.11, 2018, after a long and hard-fought battle with cancer. He was born on the family farm May 16, 1938, to Thomas C. and Ethel (Wagner) McKee. He worked on the farm through his school years, graduating from Worthington High School with the class of 1956. On Aug. 18, 1956, he married his high school sweetheart, Luana Moorhead, and brought her back to the farm, where they raised six children together. They were married for 62 wonderful years. He worked on the family dairy farm, now called Century Hill Farm, seven days a week, while also working other jobs to take care of his large family. Jim drove coal truck for awhile, then drove a Texaco Gas truck for Butler Petroleum. 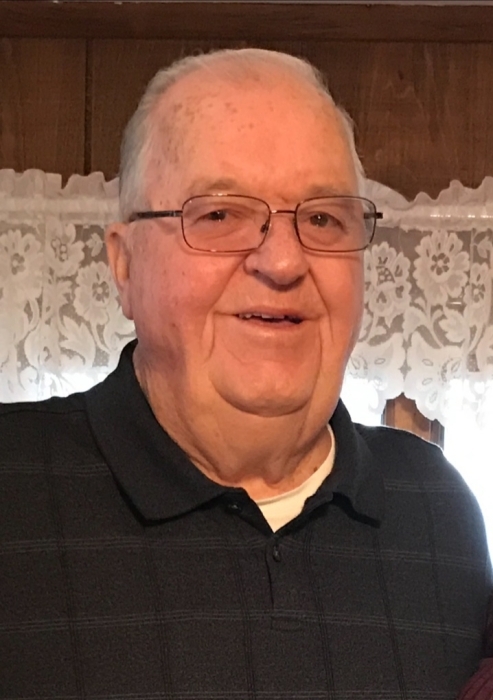 He spent ten years working at Logan Clay Products in Lairds Crossing, and was also a school bus driver for Shriver’s Bus Company at different times in his life. Jim was a hard worker. He was also a soft-spoken, caring, kind man with a sense of humor, loved deeply by his family and respected by all who knew him. Jim was a life-long member of Franklin Union Baptist Church in Worthington, where he also served as deacon. He was a member of the PA Farm Bureau, and recently resigned from South Bend Insurance’s Board of Directors due to his illness. He enjoyed John Wayne movies, crossword puzzles, and being “Poppy” to his many grandchildren and their children. His granddaughters delighted in dressing him in silly hats and animal faces, and posting his picture on Instagram. He may have enjoyed it just as much as they did. Jim is survived by the one and only love of his life, Luana, and four of his six children, Jamie (Randy) Freeman, Jackie (Ken) Stitt, Amy (Russ) Walker, of Worthington, and Debbie (Pat) Sallustio of Ohio. His daughter-in-law, Carla McKee, of Worthington, and son-in-law, Jeffrey Bechtel, of Florida, also mourn his loss. He has three living siblings, Violet (Perry) Ray of Butler, Marilyn (Robert) Elder of Enon Valley, and Jack (Judy) McKee of Montrose. Survivors also include his sisters-in-law, Darla (William) Mechling of Indiana and Cathy (Mike) Seniow of Avonmore, and brother-in-law Kenneth (Darlene) Moorhead of Kittanning; 14 grandchildren, 25 great-grandchildren, and two great-great-grandchildren will miss their “Poppy” forever. Numerous nieces and nephews will also cherish his memory. Jim was preceded in death by his parents and two of his children, Steven James McKee in 2014 and Marsha Diane Bechtel in 2017. His brothers, R. Dean McKee and T. Craig McKee, and sister-in-law Shirley McKee also passed before him. Family and friends will be received at the F. Duane Snyder Funeral Home in Worthington on Friday, Sept. 14, 2018, from 2-4 and 6-8 p.m. Additional visitation will take place beginning at 10 a.m. on Saturday at Franklin Union Baptist Church, Worthington, where the funeral will be held at 11 a.m. with Pastor Scott Jones officiating. Interment will be in the church cemetery. In lieu of flowers, memorial donations can be sent to Franklin Union Baptist Church, 108 Century Hill Lane, Worthington, PA 16262.